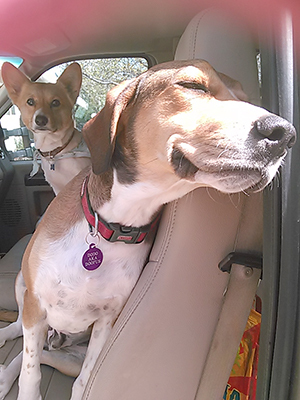 Meet the dynamic duo of tagalongs that love to hang out at the ranch - DoDo and Pee Wee. They actually live in Sedona and are only around the ranch during the day. First there is DoDo, the smiling Coonhound. DoDo is also the gatekeeper of the truck. He takes his position in the drivers seat whenever I hop out. DoDo won’t let me back in until I give him a hug and a kiss on the head. DoDo found the right home, one where he can kick back and enjoy life without fear of repercussion for his many debacles. DoDo is a powerhouse of muscle. The only problem is he hasn’t quite figured out how to harness all that power. He has knack for jumping, oftentimes miscalculating propulsion, and overshooting landings. On one such occasion, he miscalculated his leap from back to front seat and ended up doing a swan dive into the radio, thereby resetting my half-finished audio CD Vital Information and Review Questions: The Night Before Exam from questions 355 back to question number 1. Could you stay mad at a dog with that goofy mug? Pee Wee, also known as Bridgit the Midgit, is my beautiful little Corgi. This pint size pup keeps her brother DoDo in line. Pee Wee has incredible strength and speed for such a little dog. One of my favorite things to do is call her when she is on the other end of the arena. I tell her to run like the wind and she comes sailing at full tilt, little clouds of dust popping up behind her as she blazes her way across the arena. One time, I was watching one of those low budget foreign films with some guy yelling, “Run like the wind” to his friend. The film was so bad I kept asking myself why am I watching this and then just kept watching. Anyway, I guarantee that watching Pee Wee run like the wind is a whole lot more entertaining than watching that stupid movie. 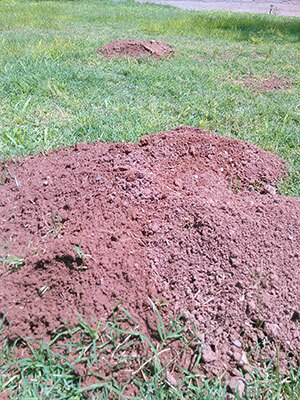 Our newest resident is a bit of a phantom and known only as Godzilla Gopher. He (I am assuming it is a he) is very good at causing mayhem and producing behemoth mounds of dirt. I run to the barn and back and Bam! There it is…a fresh mound. I can only imagine the size of the teeth and claws responsible for backfilling dirt faster than you can say Mississippi. Who needs to go Squatching when you can have your very own Godzilla Gopher siting. Mr. and Mrs. Peep have 3 babies this year. 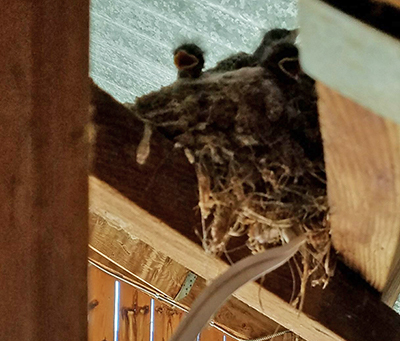 The Peeps come back to the same nest every year, which is located in the barn loft. Every day I would climb into the loft to drop hay for the horses and check on the Peeps. As I passed by their nest, I would warn them about Bad Ben and how he and his gang would scoop up baby birds just learning to fly and take them away, never to be seen again. Perspective is a funny thing and the original reason our head raven got his notorious name, Bad Ben. To the Peeps family, Bad Ben and his gang were the bad guys. There were always a good six to eight ravens in Ben’s gang perched on the fence and hanging out by the automatic waterers at the far end of the arena. They especially favored the waterer on the far northeast corner, which came to be known as The Bloody Basin. That’s where Ben and his gang would wash their ghastly goodies and leave all kinds of left overs ranging from cat food to rabbit feet to feathers and entrails floating as a lovely present for whomever happened to check waterers that day.